A lot of lines crisscross, run parallel, and ultimately connect in this story. 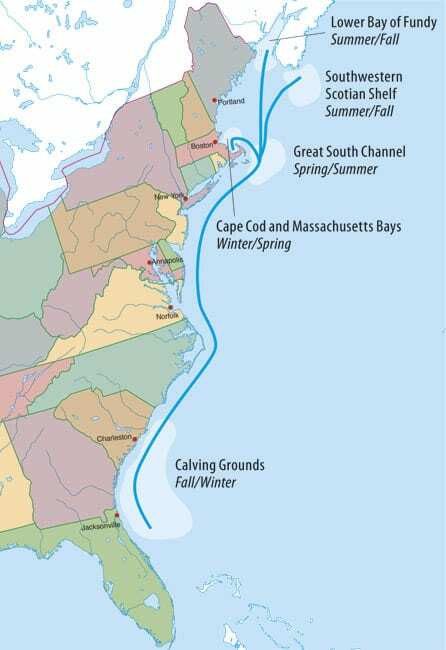 The first line is a watery one hugging the East Coast between Florida and Nova Scotia, which right whales have migrated along since time immemorial. The second is an intensifying line of vessel traffic on the east-west shipping lanes in and out of Boston—and right through prime whale feeding areas. That greatly increases the risk of lethal collisions that threaten extinction for the tiny remnant population of North Atlantic right whales. 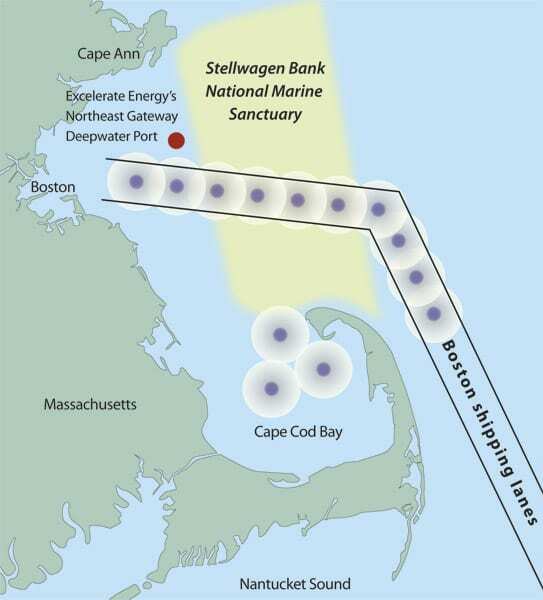 In 2005, a company called Excelerate Energy sought permission to build a deepwater port about 16 miles off Boston for large ships to deliver liquefied natural gas. Proponents believed the plan had all sorts of economic and environmental benefits, including avoiding the construction of a large gas storage facility on a populous coastline. But to marine conservationists, it was like allowing 18-wheel trucks to zoom through a school zone. The solution was unprecedented: A line of 10 buoys were anchored to the seafloor along the shipping lanes in 2008, equipped with devices to listen for whales calling in the depths. Lines of communication were established from buoy to satellite to a shore-based laboratory to confirm the presence of whales, and then on to ships to alert mariners to slow down and watch for whales. Reaching to the seafloor below each buoy was a remarkably engineered mooring line that can stretch two and a half times its length without breaking in stormy, 30-foot seas—and, at the same time, keep its underwater listening device still enough to detect whale calls. To turn this pie-in-the-sky dream of a real-time whale warning system into an up-and-running reality, a long line of people with competing interests and complementary expertise had to find ways to collaborate: Texas-based energy corporation representatives and New England conservationists, biologists and engineers, and officials from a smorgasbord of governmental regulatory agencies. Dwelling near coastlines, right whales made convenient targets for British and Yankee whalers seeking an old-fashioned energy resource: whale oil. The right whale gained legal protection in 1935. But after centuries of slaughter, scientists estimate that only a few dozen North Atlantic right whales survived. Unlike most other whale populations, the North Atlantic right whale has not recovered, hovering somewhere between 300 and 400 remaining animals. Each death diminishes the species’ survival chances. 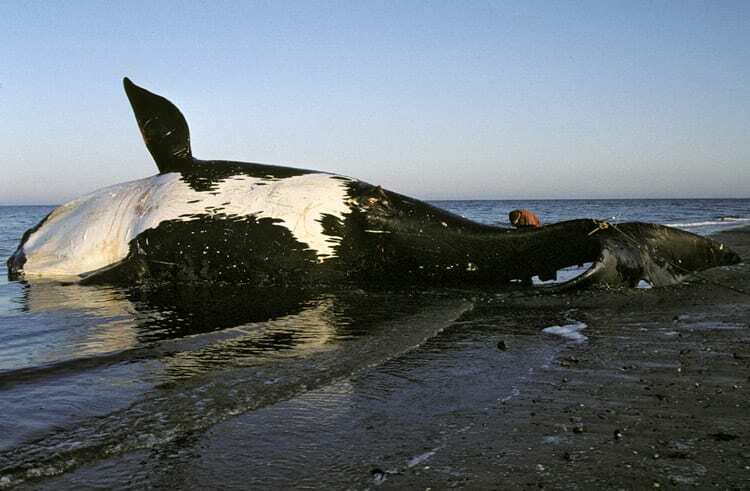 Between 2002 and 2006 alone, the U.S. National Marine Fisheries Service confirmed 10 right whales killed and two severely injured by ship collisions—but many more collisions go undetected. In 1999, coastal managers began to systematically use planes and boats to spot right whales so they could give advisories to ships. But these methods can’t be used at night or in bad weather. Nor can they find whales when they aren’t swimming near the surface. “We wanted to explore whether listening for whales might be a far better way to detect them,” said Christopher Clark, director of the Bioacoustics Research Program at the Cornell Lab of Ornithology. 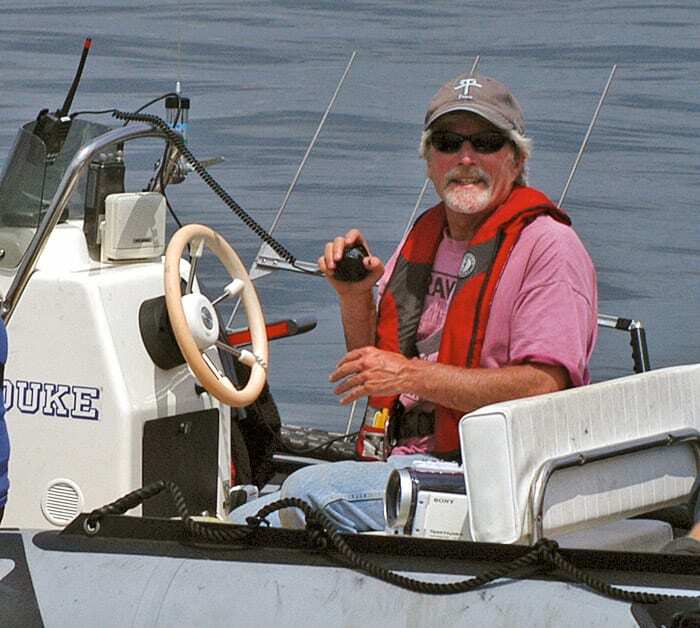 In 2001, with support from the National Oceanic and Atmospheric Administration (NOAA) and the International Fund for Animal Welfare, Clark put underwater sound recorders, equipped with hydrophones, on the bottom of Cape Cod Bay. Over the next four years, they recorded right whales calling throughout the bay from November through May. “Lo and behold, we proved that we could hear and locate right whales, even when people could not see them,” Clark said. But the scientists didn’t know that until they retrieved their instruments months later. The time gap made the seafloor recorders impractical for managers needing immediate information on whale whereabouts. 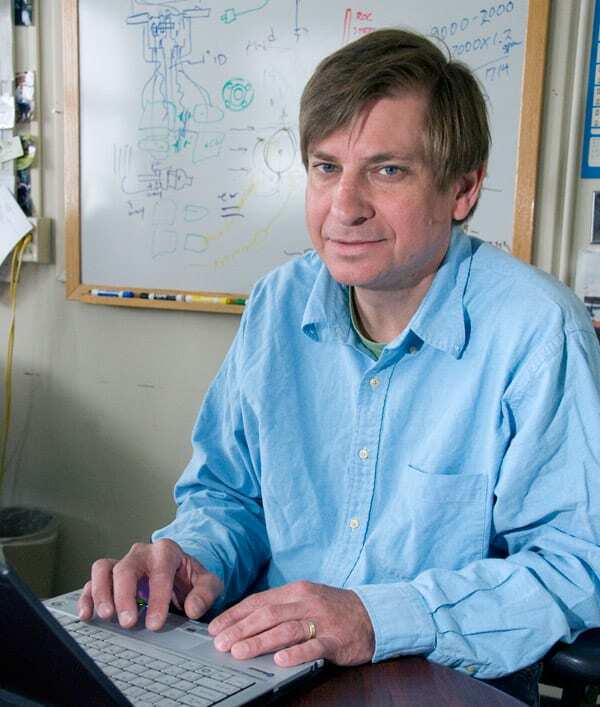 In November 2003, Clark came to Woods Hole Oceanographic Institution (WHOI) for a conference that convened researchers in diverse scientific fields and from several institutions. Organized by the WHOI Ocean Life Institute, the conference’s goal was to accelerate collaborative research that could enhance conservation efforts for the endangered North Atlantic right whale. Clark dropped by the office of his friend, WHOI engineer Keith von der Heydt. That buoy was part of a system that could relay signals of seafloor rumblings from an ocean-bottom seismometer up a mooring line to the surface buoy and via satellite to shore. Clark thought a similar system could work to detect whales. 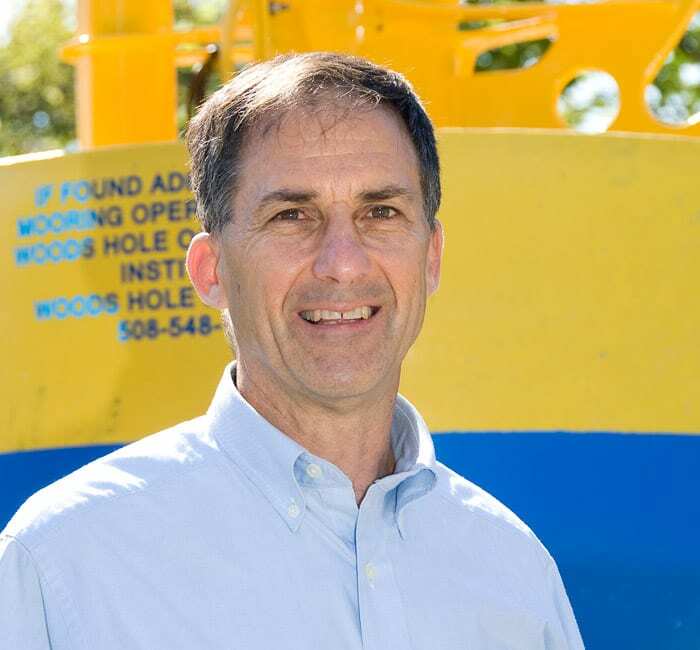 He obtained a grant from NOAA to fund a collaborative effort to try to build one, combining the Cornell Lab’s hardware, software, and know-how on whale calls with WHOI’s expertise in designing, building, and deploying moorings. Cornell scientists and engineers worked on the system’s “brains”—the auto-detection electronics unit that would reside in a waterproof canister on the surface buoy. Its job was to detect and distinguish whale calls and send timely packages of information via satellite to Cornell. But the project immediately hit a potentially deal-breaking obstacle. A hydrophone could listen for whale calls all right, but these hydrophones hung on a mooring line “that clanked and yanked,” said John Kemp, head of at-sea operations for the WHOI Mooring Operations, Engineering, and Field Support Group. “As the buoy moved around and went up and down, so did the mooring line, and so did the hydrophone. It was like sticking a microphone on the tail of a kite out the window of a moving car”—except whooshing water, rather than wind, overwhelmed the whale sounds. 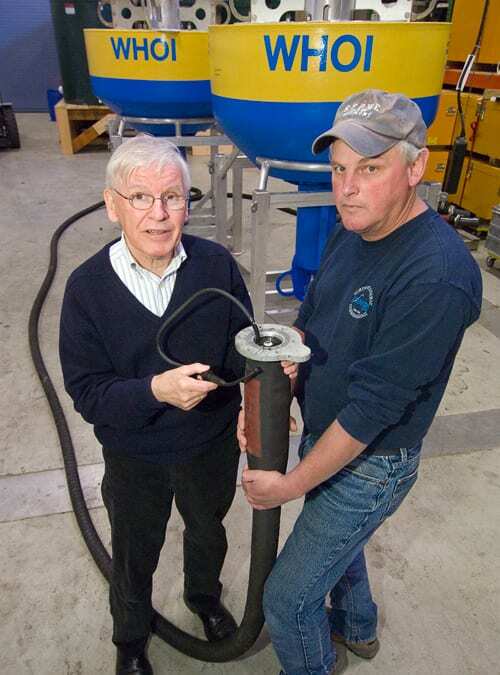 “We had to find a way to build a ‘quiet’ buoy,” Clark said. Kemp took the problem to WHOI engineers Walter Paul and Don Peters. Together, the three have nearly a century of experience working on moorings. Their innovative idea involved using two mooring segments. One highly stretchable segment attached to the surface buoy and ran down to a buoyant, 30-inch-diameter sphere about 32 to 66 feet (10 to 20 meters) under water; the second non-stretchy segment connected the sphere to a seafloor anchor. 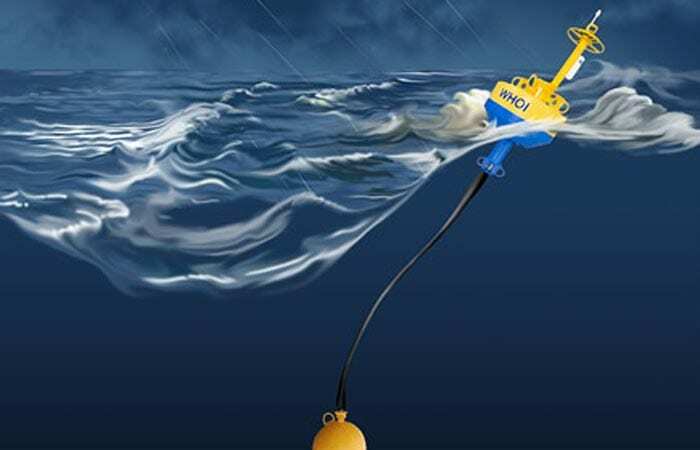 The intent was to decouple the hydrophone on the lower mooring line from the motions and violent pulls of a surface buoy, which is frequently buffeted by high winds and large waves. The top line would act like a bungee cord or a shock absorber. The bottom line, pulled tautly up from the anchor by the buoyant sphere, would remain straight and stationary—a stable, quiet platform for the hydrophone. Taking concept to conception, however, was more easily said than done. The top line, for example, had to survive punishing strains and loads, stretching up and down in waves or bending sideways as the buoy made wide circles like an energetic dog chained to a stake—without breaking. That challenge went to Paul, whose Ph.D. thesis back in 1967 concerned the textile mechanics of rope. His task, essentially, was to weave a new “rope” with unprecedented mechanical properties. Paul exploited technology used to make better tires. Fabricated just from rubber, tires would stretch too much and would weaken and fail after a few miles. So synthetic nylon and polyester yarns—tire cords—are embedded into the tire body to add strength and keep the stretching under control. Paul had already been experimenting with rubber hoses for moorings. To design “fabric” for this new mooring hose, however, he first needed to know what it would be up against. 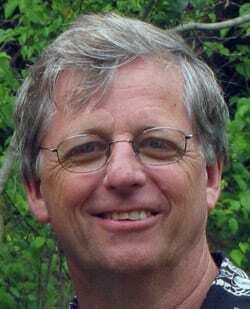 He called in his colleague, Mark Grosenbaugh, a senior scientist at WHOI. Over the years, Grosenbaugh and his graduate students have developed a computer program that can simulate the forces that can act on moorings—buoyancy, gravity, currents, waves, drag, and so on. The key ingredient turned out to be the top element of the mooring, nicknamed a “Gumby” hose after the pliable green cartoon character. Grosenbaugh calculated that to support the mooring tensions in all expected weather conditions and wave heights, the 50-foot hose would have to at least double its length, stretching like a rubber band. But to ensure that it would never overstretch and snap, the key was finding the precise spiraling geometric arrangement for “weaving” together the rubber and textile reinforcing material. Like ribbons around a maypole, the tired cords are wrapped at angles carefully calculated to simultaneously optimize the fabric’s load capacity and the hose’s stretchability. When the test results matched the model predictions, the WHOI engineers filed for a patent in December 2008. Other technical obstacles remained. For example, rubber stretches; copper doesn’t. The copper wires that transmit electrical signals from hydrophones up the line can be elongated only a few times before they break. Paul had tackled that problem, too. In earlier versions of the hose, he inserted spirally wound coil-cord—like an industrial strength telephone cord—into the hose cavity. The coiled cord could stretch and bend like a Slinky, riding inside the hose as it stretches and bends. But there was still some concern that after many stretch cycles, the copper conductors inside the cord would become work-hardened, or brittle, and then break. But in laboratory tests to investigate this possible failure mode, the wires in the coil did not fail even after being stretched more than six million times—the typical number of wave cycles they would experience in a year in the ocean. In a test mooring in the Pacific Ocean, they still reliably conducted electrical signals even after several years of deployment. So Peters and colleagues replaced noisy couplings throughout the system with hard-bolted mechanical connections that reduced both noise and wear. Peters developed customized end fittings for the hoses that terminated into electrical connectors, into which the hydrophones and other componments could be easily plugged. The result is a long, quiet, direct electrical pathway—fully protected from seawater—that transmits signals and power between the listening hydrophone below and the surface buoy above. For the mooring to be successful, each component had to work, and all the components had to work together. Meanwhile, Clark’s group had its own technical issues to deal with. They honed the software that automatically distinguishes whale calls from other sounds (including ship noises) recorded by hydrophones. They worked on the problem of how to maintain contact between satellites and a computer on a buoy rocking and rolling in the Atlantic. Between 2004 and 2006, the Cornell/WHOI team tested experimental moorings in Cape Cod Bay, a long-studied, food-rich, seasonal hangout for right whales on their way to summer feeding grounds further north. The research was closely followed by Dan McKiernan, deputy director of the Massachusetts Division of Marine Fisheries, who was also interested in a better way to monitor right whales and avoid conflicts with the boating public and fishing fleets in waters under his jurisdiction. Juggling so many technical issues, both inevitable and unanticipated, the researchers faced setbacks, including running out of money. McKiernan became an angel. He helped keep the project going by adding supplementary funds, or sometimes just arranging for the researchers to hitch a ride with fishermen to work on the whale buoys. By the spring of 2006, the moorings “still couldn’t give Dan the information he needed, but he had faith,” Clark said. And then a real deadline appeared: Excelerate Energy applied to build the Northeast Gateway Deepwater Port. That set in motion a fast-moving, high-stakes process to assess and possibly mitigate the port’s environmental impacts, particularly on whales. Anticipating more demand for natural gas in New England, Excelerate Energy wanted the deepwater port for its fleet of ships carrying liquefied natural gas, or LNG (which is 600 times more dense in this form, and thus easier to transport). The offshore port consisted of two flexible pipelines called “risers,” connected at one end to a new undersea pipeline that would tie into an existing natural gas pipeline on shore. 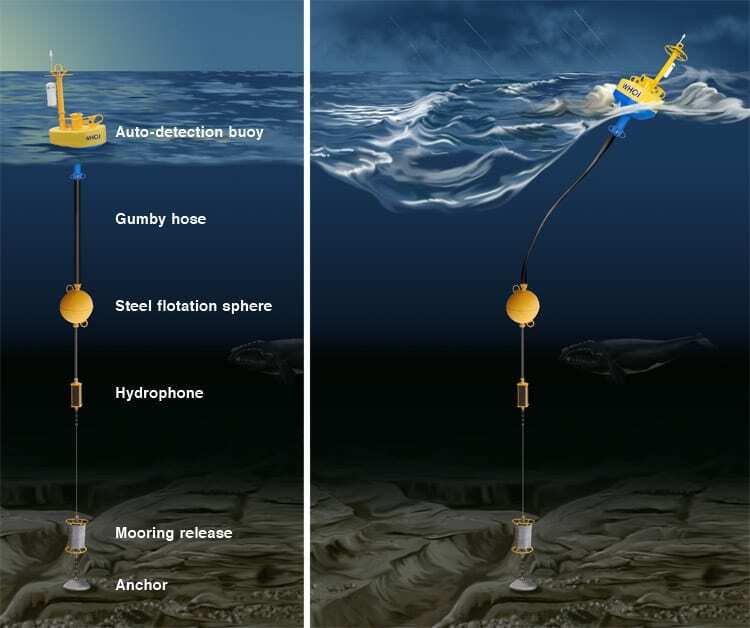 Each riser attaches to a buoy anchored to the seafloor and floating about 100 feet below the ocean surface. 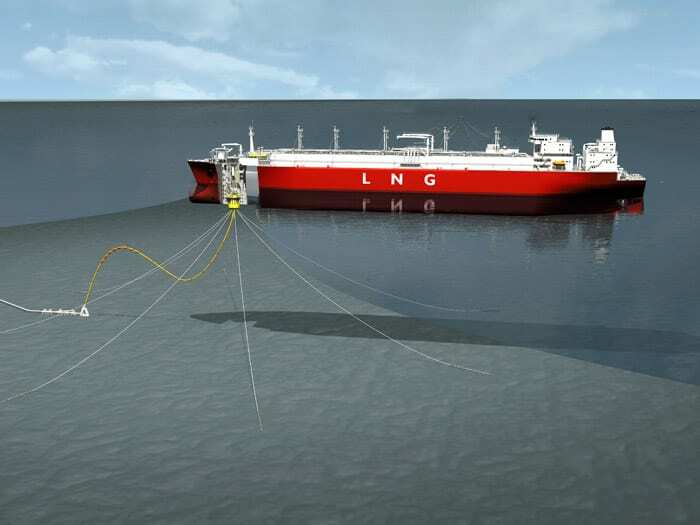 Incoming Excelerate Energy ships would retrieve the buoys, bring them on board, re-gasify the LNG cargo, and pump the gas down the riser and through the pipeline. The problem was that Excelerate Energy’s ships—954 feet (291 meters) long and more than 90,000 tons—would use the designated shipping lanes into and out of Boston harbor, which traverse prime right whale waters, including the boundaries of the NOAA Stellwagen Bank National Marine Sanctuary. That potentially put the whales in harm’s way, said David Wiley, the sanctuary’s research coordinator. Excelerate Energy’s proposal, along with a similar one from a company called GDF SUEZ Energy, came just as scientists, conservationists, and federal officials were about to celebrate victory in a multiyear effort to persuade shippers to shift and narrow the Boston shipping lanes slightly to avoid waters with high concentrations of whales. The whales are protected under three separate federal laws: the Endangered Species Act, the Marine Mammal Protection Act, and the National Marine Sanctuary Act, Wiley said. A fourth act came into the play: the National Environmental Policy Act (NEPA), which “requires federal agencies to integrate environmental values into their decision making processes” and consider reasonable alternatives to mitigate environmental impacts. Coordination of the NEPA process in this case fell to the U.S. Coast Guard, and in particular, to a then-Coast Guard official named Patience Whitten. She had concerns about the potential impacts on marine mammals from increased LNG ship traffic and sought advice from Wiley and Leila Hatch at the NOAA marine sanctuary. Wiley and Hatch brought in a wealth of convincing data from a wide variety of researchers, demonstrating the shipping threat to whales. Wiley also knew about the Cornell/WHOI buoy project. When he recommended the idea of using the whale-buoy technology, Whitten agreed that it offered a lot of promise and put it on the table in negotiations with the LNG applicants. Wiley and Hatch recommended that ships should reduce their speed year-round to 10 knots in the sanctuary. That idea was rejected by the Coast Guard and the Department of Transportation’s Maritime Authority. But under the licenses eventually granted to build the deepwater ports, the companies were required to build and maintain the whale auto-detection buoy system. When the whale-buoy system alerted vessels to the presence of whales in the shipping lanes, LNG ships would be required to post trained personnel to look out for whales and slow down to 10 knots or less. That would increase the chances of spotting whales and give whales more time to get out of the way—reducing the risk to whales and the risk to the companies under the federal environmental laws. Excelerate Energy had a lot on the line. And now so did Clark, Kemp and company, who—only a few months before—had managed for the first time to get one of their auto-detection whale-buoys to work as originally planned. 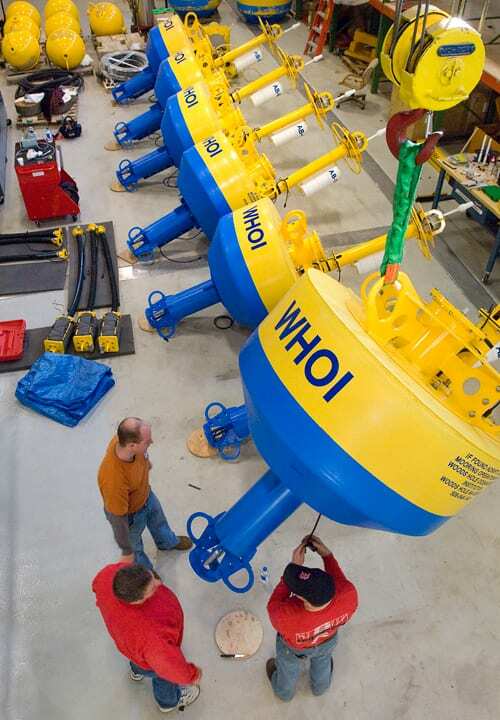 Excelerate Energy commissioned the WHOI mooring group to design and build 16 moorings for the port. The first six went into the water in the spring of 2007 to monitor whales while the company constructed its underwater pipeline and installed its riser buoys. The moorings got their first major test in November 2007 when Tropical Storm Noel generated 25-to-35-foot seas. “The moorings stayed where we put them and didn’t break,” Kemp said. And just as crucially, the hydrophones delivered high-quality sounds from the depths, despite the storm raging on the surface. When the port construction was completed, the first six came in for refurbishing and the other 10 moorings were deployed in the 55-mile-long shipping lane, each five miles apart so that the five-mile listening radius of each hydrophone just overlapped. Not all the moorings were alike. Exactly where to position the subsurface sphere on the line depended critically on the water depth where each mooring would be placed. Some deeper moorings required two Gumby hoses working in concert. Clark’s lab group had continued to refine the auto-detection electronics unit. They dramatically improved its reliability while reducing power consumption, which cut costs to transmit data via satellite and reduced the need to send out ships to change batteries. Several other technical items moved from wish list to reality. All day every day, the computer on each buoy analyzes the continuous stream of sounds from the surrounding ocean. It “sifts through the acoustic smog,” as Clark puts it, separating out from the background cacophony the distinctive call that right whales use to keep in touch: a deep whoop lasting one to two seconds, with an ascending tone. The data are relayed to a command-and-control center at Cornell, where trained analysts remove any false detections, validate the presence of right whales, update a dynamic database, and relay messages to inbound LNG ships. When LNG ships approach the shipping lane, analysts are on duty until the ships are anchored at the port, issuing updates to ships every 20 minutes. At this time, only Excelerate Energy’s LNG ships are mandated to reduce their speeds in the areas around buoys that have detected whales. But NOAA urges all ships to check whale-buoy alerts and slow down if necessary. Early on, Wiley had the foresight to realize that whale alerts could be incorporated into an ongoing and entirely independent effort to create something called the Automated Identification System, or AIS. Mandated by the United Nation’s International Maritime Organization for large commercial traffic worldwide, the AIS transmits ships’ locations, directions, and speeds to receivers on all vessels in their vicinities and to shore-based receivers; it serves as a maritime equivalent of air traffic control in coastal waters. 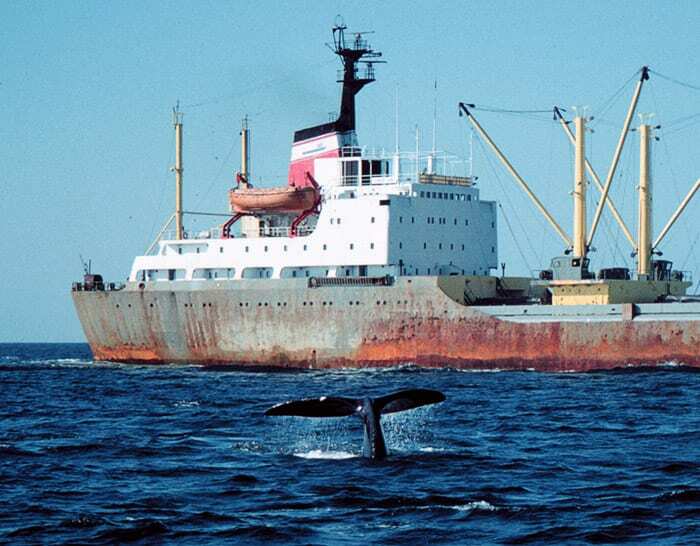 AIS was designed to prevent ship collisions, Wiley said, but if you added in real-time information about whale locations, it could also help ships avoid collisions with whales. “The more boats we can work into the system, the safer it will be for whales,” he said. “We’ve been saying all along that if we can get real-time information, we want to avoid (whales),” Kathy Metcalf of the Chamber of Shipping of America told the Associated Press. “There’s no doubt that anybody on a ship, given sufficient room to do it, would take all the avoidance behaviors in the world” to prevent a strike. 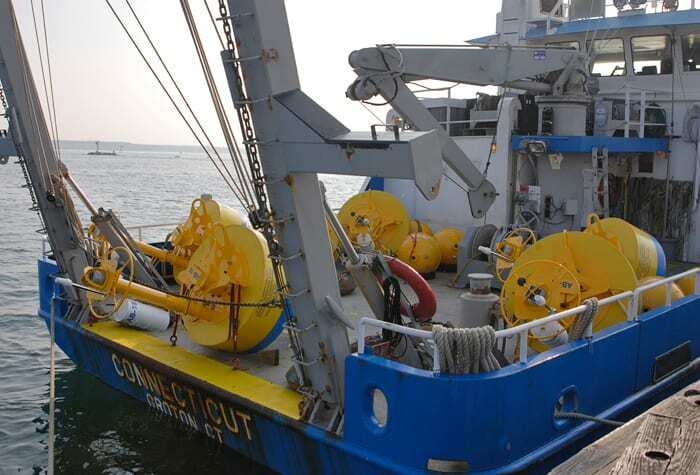 In 2008, the Cornell/WHOI team deployed two whale-detection moorings for NOAA to monitor the shipping lanes off Jacksonville, Fla., one of the East Coast’s busiest ports. The lanes cut right through right whales’ winter calving grounds. “It gives us the ability for nighttime, all-weather notification that whales are in the area,” said Lance Garrison, a researcher at the NMFS’s Southeast Fishery Science Center in Miami. Kemp, WHOI engineering assistant Kris Newhall, and Chris Trembaly from Cornell just deployed an auto-detection whale buoy, commissioned by NOAA researchers, in the Bering Sea to try to detect rare and elusive Pacific right whales, a separate species. Beyond their benefits for whale conservation, the buoy systems also provide a scientific bonus: unprecedented new capabilities to explore the dark depths. The technology used for the right whale moorings has other applications, as well, Peters said. In November 2008, the WHOI mooring group deployed a demonstration mooring off southern California that aims to meet a different need: detecting illicit vessel traffic. The U.S. Department of Homeland Security funded that effort and hopes to use such passive acoustic arrays to detect smuggling activities and protect harbors, Kemp said. 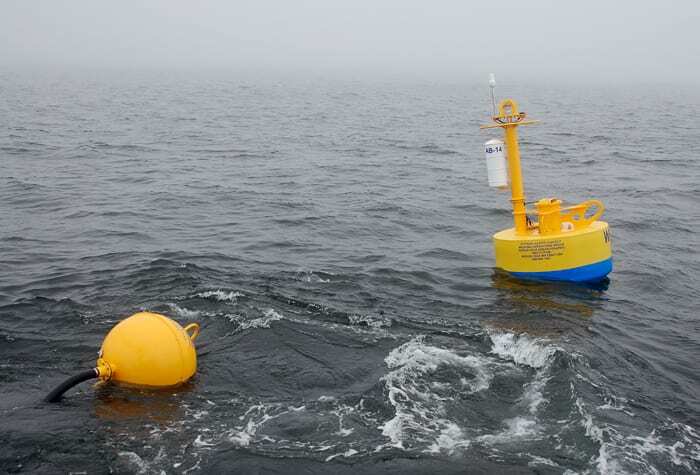 Excelerate Energy is reviewing a proposal from WHOI to fund additional development of wind- and solar-powered battery systems for the buoys to extend their life and reduce maintenance costs.